This paper investigates how coastal mobility and a community’s place within regional trade networks intersect with technological organisation. To do this, we identified different types of lithic production and exchange during the late pre-colonial period at three coastal sites around Madang in northeast New Guinea. The study is the first major technological and sourcing study in this area. Consistent with terrestrial models, lithic technological analysis crucially shows that groups with higher levels of coastal mobility (1) were reducing a wider range of lithic materials and (2) reduced material less intensively than groups with indirect access. Conversely, groups with lower coastal mobility levels (1) were flaking a restricted range of lithic materials and (2) reduced material more intensively. Geochemical analysis, using X-ray fluorescence, shows that at all three sites obsidian artefacts exclusively derived from Kutau/Bao (Talasea) in West New Britain. This indicates that, by about 600 years ago through to the late nineteenth century, the Kutau/Bao source had become a specialised export product, being fed into major distribution conduits operational along the northeast coast. Importantly, there is no evidence for exchange with other sources such as Admiralties or Fergusson Island obsidian. This is contrastive to the Sepik coast, where obsidian from the Admiralties Islands featured prominently alongside West New Britain obsidian, and suggests the emergence of different coastal supply lines feeding the northeast Madang coast and the north Sepik coast. The online version of this article ( https://doi.org/10.1007/s12520-018-0713-8) contains supplementary material, which is available to authorized users. Mobility and movement in the human past have recently been described as key theoretical concerns in archaeology (Close 2000; Kahn 2013; van Dommelen 2014), and in the social sciences more generally (Cresswell 2011, 2012, 2014; Greenblatt 2009; Sheller 2014). Instead of conceiving ‘sedentary’ communities as static and coherent, we are being encouraged to think about the dynamic lines of movement and flow that bind and sever people, places and objects (Greenblatt 2009: 2; Ingold 2011: 145; Mazzullo and Ingold 2008; Pooley 2017). Many of these connections are materialised by supply lines, linking producers with distributors and consumers. 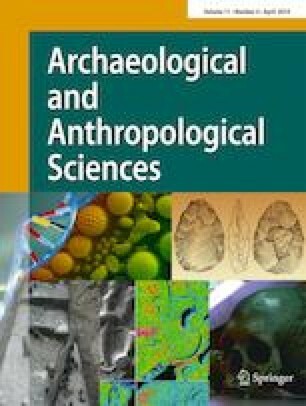 This is especially the case as archaeologists increasingly try to tap into the emergent globalising material networks that characterised different geographic areas of the world at different times (Hodos 2017). One such area was the northeast coast of New Guinea in the recent pre-colonial past (Lilley 2017), which is here presented as a case study to examine how coastal mobility and a community’s place within regional trade networks intersected with technological organisation. This region was host to complex interconnections between traders, horticulturalists, fishing peoples, pottery makers and other craftspeople, bound together by the movement of material goods such as stone artefacts. Identifying the coastal and interisland movement of these stone artefacts remains a central methodological agenda in archaeological research (e.g. Elizalde-Rodarte et al. 2016; Isern et al. 2017; Neri et al. 2015; Orange et al. 2017; Phillipps et al. 2016; Reepmeyer et al. 2016; Ross-Sheppard et al. 2013; Zvelebil 2006). In doing so, archaeologists attempt to sketch out the material supply lines that connected geographically disparate, but culturally mobile, people in the past. Teasing apart the technological choices underlying whether to procure material locally or to obtain it from further afield is essential to understanding how people were moving around the landscape, and the politics of exchanging ideas and commodities with other groups. Most of what we know about these technological choices stems from assigning archaeological raw materials to source, using geological and geochemical techniques. By examining the differential distribution of raw materials from a variety of sources across the region, we are able to look at the nature of these exchange networks, and trace out the different lithic supply lines linking site to source. We can then build a picture about changing modes of social connectivity that typified the coast at different times in the past. This can be supplemented by information about what we know from the exchange of other artefact classes such as ceramics. Additionally, by examining the technological choices made during lithic flaking, use, reuse and discard, we can untangle differential treatment of raw materials for different intended functions. Were some materials more intensively conserved, while others quickly and expediently flaked? The conservation of different materials gives insight into the availability of these materials and hence the nature of access, and the mobility of the procurers. Moreover, similarities in technical procedures can give clues to intergroup movements and the mobility within communities. Stone tool technology in the Pacific has been crucial to building these theoretical models about coastal mobility and exchange in the broader discipline. For instance, Sahlins (1972: 282) uses the northeast New Guinea coastal groups, such as the Siassi and Bilbil traders, to illustrate one important configuration of mobile exchange: that featuring nodes of middlemen trading groups, marginally situated, but at the heart of long-distance redistribution networks. In this way, a large number of specialist products formed the material links between diverse social groups and a small number of highly mobile and strategically placed traders who were able to control profit and exchange rates around the coast (Harding 1967). This paper examines the nature of import into one of these hubs of highly mobile traders and shows how mobility levels and local power relationships played out in access to lithic material. Despite featuring substantially in theoretical discussions of mobility and exchange, archaeologically, there is a major blind spot in our knowledge of Near Oceanic lithic distribution networks; we know something about the ethnographic period, and about the Lapita period, which saw the first pottery makers enter the Pacific over 3000 years ago (Summerhayes 2007), but very little is known about what changed during the post-Lapita to recent pre-colonial period, a timespan of about 2000 years (Summerhayes 2004). It was at this crucial time, during successive fragmentations and rearrangements of social networks that many of the incipient systems of ethnographically observed trade networks emerged (Lilley 2017). In tracing how these supply networks grew, and how concordant group mobility informed technological organisation, we can examine the nature of social connections in the last millennium before present. The northeast coast of New Guinea in particular is an enigma. Although stone tool technology in and around the Bismarck Archipelago has been described previously, nothing has been written about flaked technology on the northeast coast of New Guinea, which extends from the mouth of the Ramu River to Astrolabe Bay and the Huon Peninsula. It was along this coastline that ethnographic groups such as the Bilbil speakers acted as mobile subsistence traders in the Madang exchange network, interlinking with the Siassi and Tami exchange networks (Harding 1967). This paper therefore presents the first substantial lithic technological and sourcing study from northeast New Guinea. It is interested in tracing what these trade networks looked like in the recent pre-colonial past of northeast New Guinea, during the last millennium leading up to ethnographic contact in the late nineteenth century. It is also interested in how different levels of mobility within these networks informed technological organisation in different ways. Recent narratives for the area have suggested that this was a key period of change, whereby a number of seaborne middlemen groups began specialising in producer-trading, redistributing goods around the coast with increasing intensity leading up to European contact (Gaffney et al. 2017; Lilley 2017). This seems to have been a time when mobility and social interactions were intensifying, creating increasingly small but highly complex trade networks around the coast. However, these models have been built primarily upon ceramic evidence. To interrogate these models further, the lithic technology and source of artefacts from three sites in the Madang district of northeast New Guinea—the heart of the pre-colonial Madang exchange network—are here examined to describe the specific lines along which materials passed from procurement to discard and differences in mobility reflected by differential production, use and discard. These sites are (1) Tilu at Malmal village in Madang Lagoon, (2) Nunguri on Bilbil Island, along with surface collections made on (3) Yabob Island. Before examining this specific northeast New Guinea case study, it is necessary to situate the research alongside the wider archaeological literature on mobility and exchange. Not least of all because theoretical approaches to both of these topics have shifted substantially since Sahlins’ (1972) description of the northeast New Guinea groups in Stone Age Economics. It is also essential to make clear the interpretive links archaeologists invoke when tying lithic technological organisation to mobility and exchange. Mobility is re-emerging as a core concept in the social sciences, labelled the ‘mobility turn’ (Cresswell 2011), which recognises that everyone and everything are inherently mobile and in processes of flux. As Basu and Coleman (2008) point out, Melanesian exchange practices such as in the Kula network (see Kuehling 2005; Malinowski 1922), is one particular form of highly mobile arrangements of people and objects moving through the landscape. This is trickling into archaeology (e.g. chapters in Kiriatzi and Knappett 2016), and although ‘mobility’ has always been central to the discipline, the new literature begins to tease apart the concept by investigating the specific mechanisms relating individual technical traditions to the transport of artefacts, the movement of individuals and larger population shifts. Knappett and Kiriatzi (2016: 7) call for us to disentangle mobility; rather than using it as a sliding scale with two dimensions (more or less mobile), we can think about who or what was moving and perhaps why, to examine the individual working parts of the overall mobility practices within a society. We can also examine how different things (people, objects, animals, plants) were differently mobile and facilitating the movement of one another (Summerhayes 2003a). Early archaeological approaches emphasised the mobility of terrestrial hunter-gatherers, contrastive to the sedentism of food-producers (see Kelly 1992: 43). However, although hunter-gatherer groups more frequently practice specific modes of mobility (e.g. residential, logistic, or territorial mobility, see Binford 1980, 1982), subsistence producers and traders also remain mobile, sometimes moving further and more often, but the modes and impetus are usually different (e.g. more frequent canoe-based trade expeditions or exogamous marriage exchanges, or less predictable movements due to natural disaster, warfare, or colonial disruptions). Moreover, mobility was almost never equal within communities and between different social groups (Kelly 1992). For instance, high-status individuals might regularly perform long-distance travel (see Knappett and Kiriatzi 2016: 6), or specific social groups might simply be more extensively mobile within a broader community of practice. So, although everyone and everything are inherently mobile, it is the contingent relations between movements that are keys to examining mobility in a meaningful way (Adey 2006). For instance, is one group more frequently mobile than another; are some raw materials moved across hundreds of kilometres and others collected locally? Mobility then also has important implications for power relations, as uneven access to exotic prestige goods, or even bulk subsistence crops and practical objects, afforded by direct access or more trading partners, can promote success (Gaffney et al. in press b; Sinclair et al. 2012). As Broodbank (2016) notes, small island worlds such as the Mediterranean—and we would add the Pacific—can benefit aggrandising behaviours and risk-taking individuals willing to sail the extra mile. In this way, changes to the relations between intra- and intergroup mobility practices may have profound effects not only on technological organisation but also the formation of inequality within and between communities. Mode—A qualitative description of how the movement is undertaken. This might include movement on foot, by domestic animal or by watercraft. Schema—A top-down descriptive model or approximation of how movement is structured within a social group. This might involve logistical forays by some individuals from shifting home bases, long-distance cyclical trade excursions, residential shifts by whole groups, and so on. Frequency—How often a group or individual moves. Range—How far a group or individual moves. These attributes are underlain by other dimensional constraints such as scheduling, resource locations and quality, regional networks of trade partners and structures of social meaning (see Fallov et al. 2013). For instance, mobility practices sometimes shape lithic technology as they limit the time available for reduction and raw material procurement, as well as the weight of tools to be transported (Bamforth 1986). How then do we identify differential modes, schemata, frequencies and ranges of mobility in the archaeological record, specifically by understanding lithic technological organisation? Technology is part of the broader social world and is therefore interlinked with other aspects of society such as mobility. Some types of mobility, such as high-frequency or long-distance residential movements on foot, can be tightly constraining factors for technological organisation, while others can enable a substantial amount of variation and change. However, Sullivan III (1994) raises concern with attributing technological organisation to single social processes, such as mobility. Instead, multiple interlinked factors such as technical function, resource availability, and settlement histories combine to affect technology and the physical artefacts. Bamforth (1986) in his study of Mojave Desert raw material procurement strategies shows how technological organisation can remain invariant despite mobility shifts, but other factors such as the distance to good quality raw materials can play a major part in the overall technological organisation. If good raw materials are replete in the local area, then there are fewer constraints on technological organisation and fewer impulses to create chronological variation (see also Andrefsky 1994a, b). As such, there are no simple relationships between artefacts and movement, and a series of carefully layered inferences must be used to deduce possible mobilities (Kelly 1992). These inferences should be historically and regionally contingent, as identical technological attributes may reflect a number of possible mobility scenarios, and vice versa (i.e. equifinality). It is unclear how models based primarily on terrestrial foragers hold up when dealing with more residentially ‘sedentary’ horticulturalists, fishing peoples or subsistence traders. What happens when we try to link coastal and island mobilities to technological organisation, in particular, to lithic technology? Torrence (1989: 13) notes that different modes of mobility place uneven carrying costs on different groups. For instance, due to a forager’s generally long-range movements on foot with restricted transport options, the number of artefacts moved between groups/sites will be limited. In contrast, more residentially ‘sedentary’ canoe-faring groups should be able to transport bulk artefacts or raw material between settlements with few constraints (Allen 1982). In this way, seafarers may have provisioned themselves with stone material, but at the home settlement, the artefacts will reflect the nature of strategic seagoing: going out and collecting raw material and bringing them back for use. Coastal and interisland mobility also carries different infrastructural risks and benefits, and requires different technological innovations and expertise (Calvo et al. 2011). For instance, movement via canoe is faster than on foot, but landings and adverse weather produce other challenges. Recent approaches to coastal and interisland mobility in the Mediterranean attempt to show how toolmakers were moving around the landscape and sharing technical traditions by identifying similar production sequences and diagnostic, community-specific technical actions left behind as traces on the artefacts (Knappett and Kiriatzi 2016). These studies promote an examination of the technological sequences of procurement, production, distribution and use. This is the chaîne opératoire or chain of operations (see originally Lemonnier 1992, Leroi-Gourhan 1943; Shott 2003), compatible with the Anglophone behavioural chain or reduction sequence approaches (Hollenback and Schiffer 2010; Schiffer 1995; Skibo and Schiffer 2008). Because technical actions, such as stone working, are an extended and situated learning process which takes place within ‘social scaffolding’ (Bevan and Bloxam 2016; Stout 2002), commonalities in the chaîne opératoire suggest group-specific ways of making and intragroup mobility within broader communities of practice, regulating production sequences. Variations in the chaîne opératoire may imply internal innovation to address specific functional concerns, individuals moving in from other learning traditions, or of course the exchange of artefacts. These lithic learning processes take place within specific environments and involve revisiting important places, understanding which sources of material are useful, and passing this knowledge down through generations (Smith and Kielhofer 2011). We can think of these as lithic landscapes (Barrientos et al. 2015; Hiscock 2014; Foley and Lahr 2015; Ford 2011; see originally Gould and Saggers 1985). Because mobility is in part shaped by uneven distributions of lithic raw materials in the landscape, understanding the local lithic landscape is important, especially how procurers, manufacturers and distributers situated their learning in this landscape. De Bruijn (2006), in her study of obsidian flaking on Sardinia, describes the raw material environment as a lithic taskscape, within which various activities of procurement, exchange, reduction and use would take place, intersecting with movements of people and transport of raw materials, between trade partners, and to manufacturing sites. In this way, we can examine how chaîne opératoire are situated within the lithic landscape/taskscape, which parts of the chaîne occurred in different places, and how these parts articulate with others. By examining the chaîne opératoire across a lithic landscape/taskscape, it allows us to consider both the spatial and time dimension of movements; how long did it take for a material to move from its original source of procurement to its place of manufacture and discard (Pollard et al. 2014)? From previous lithic studies, we can also hypothesise that specific chaînes opératoires, or flaking techniques within each chaîne, will be associated with different attributes of mobility. For instance, highly variable raw material procurement from a lithic landscape could imply either (1) wide-ranging mobility on the part of the manufacturers or (2) the maintenance of extensive supply lines. The nature of lithic supply can minimally be reduced to ‘direct access’ or ‘exchange’. When goods are exchanged, this might involve direct reciprocity, down-the-line, or central-place redistribution (Summerhayes 2015), and these processes may be clear to the final makers and users prior to discard, or may remain unknown. Phillipps et al. (2016) describe exotic lithic materials being transported from over 300 km away in northern New Zealand and make clear that it is difficult to distinguish direct access, long-range, canoe-based mobility from down-the-line exchange. We cannot solve these problems simply by identifying different raw materials from the lithic landscape and so technological studies of the chaîne opératoire are crucial. 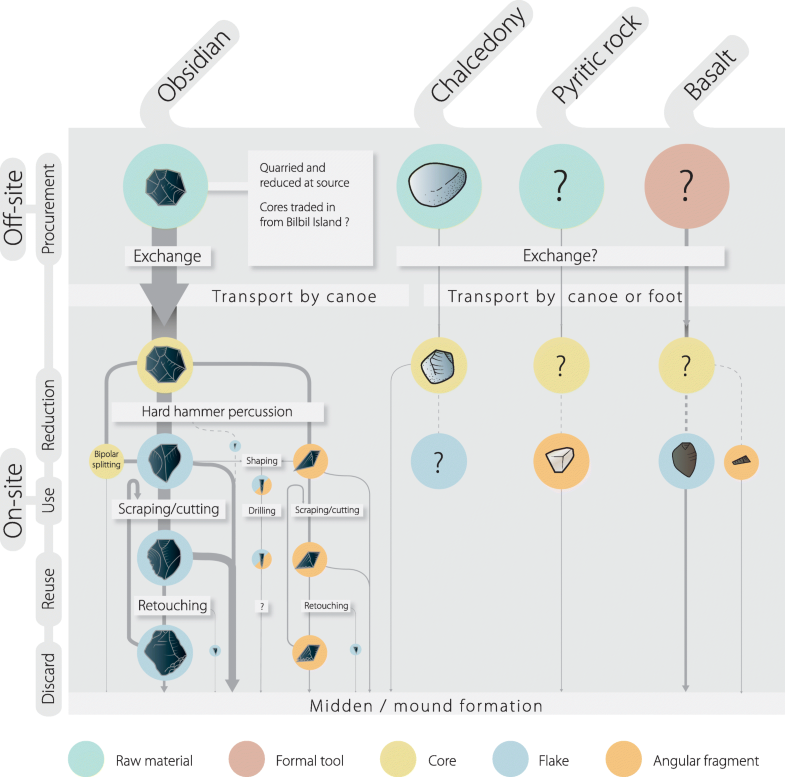 Different mobilities and lithic supply—whether informal down-the-line trade, formalised long-range reciprocal exchanges, or direct access—should leave different patterns of attributes on the stone tools (McCoy and Carpenter 2014). Large, expedient artefacts with substantial cortex, for instance, should indicate more direct access to the source material. On the other hand, smaller and intensively reduced artefacts with no cortex would imply indirect access or down-the-line trade, and distinguish the material as high-value for specific functions. Table 1 presents an exemplar of how different technical elements in the chaîne opératoire could be used to inform interpretations about coastal mobility and lithic supply. This exemplar will be used as a guide, as we now turn to the case of lithic supply and coastal mobility in northeast New Guinea. The earliest evidence for the interisland exchange of lithic material in Oceania comes with Mopir obsidian being transported from New Britain to Matenbek site on New Ireland in the Late Pleistocene (Summerhayes and Allen 1993). Raw material continued to be redistributed around the Archipelago and onto the mainland of New Guinea on a small scale, up into the Late Holocene, when Austronesian-speaking groups associated with Lapita pottery production monopolised on the procurement and redistribution of the Talasea obsidian sources in New Britain (Summerhayes 2017). Following the Late Lapita period, around 2200 years ago, there seems to have been a ceramic hiatus around northeast New Guinea, associated with a fragmentation of long-distance exchange networks (Lilley 1988). However, from sites along the Sepik north coast, there appears to have been increasing complexity in the networks linking social groups to obsidian source. Previous sourcing studies along the coast, using pXRF and LA-ICP-MS, have described four major sources of imported obsidian: Talasea in New Britain, and Umrei (Lou Island), Wekwok (Lou Island), and Pam Lin in the Admiralties (Golitko 2011; Golitko et al. 2010). These artefacts demonstrate the developing exchange links with the Bismarck Archipelago from perhaps the mid-Holocene, through to the recent pre-colonial period. Those sites suspected to date to earlier, with pre-ceramic occupation in the mid-Holocene, contained substantially higher frequencies of West New Britain obsidian, while those deriving from the post-Lapita period, c. 2000 years ago, contained substantial Admiralties obsidian. This is consistent with PIXE-PIGME analyses demonstrating that all obsidian artefacts from Tumleo Island dating after 1300 years ago derived from the Admiralties (Summerhayes 2003b). Other research has also assigned all surface collections from Wewak and Aitape to Admiralties sources (Bird et al. 1981: 70). An examination of the sub-sources (Umrei, Wekwok, Pam) from the Admiralties present at different sites around the Sepik indicates that connections with suppliers in the Bismarcks were complex and variable (Golitko et al. 2010). Seven pieces of obsidian from Ali Island, Seleo Island, and Tarawai Island along the Sepik coast also derived from the West Fergusson source in the Massim region of southeast Papua (Golitko et al. 2012). Although these artefacts all come from surface collections and remain undated, West Fergusson obsidian has also been identified from excavated contexts dating to 800 years ago at Koil in East Sepik province (Summerhayes, personal communication) and in undated Madang Highlands collections (Gaffney et al. 2016). This suggests that small-scale, down-the-line exchange was opening up between the Massim and north New Guinea, either through the north coast of Papua and the Huon Peninsula or via interisland exchange with the Bismarcks. On the northeast coast itself, only a handful of obsidian has previously been sourced, and they have exclusively derived from New Britain. At Sio (KBQ and KBP sites), three obsidian artefacts recovered by J. Specht were sourced by PIGME to Talasea (Bird et al. 1981: 70). Nearby at Arop/Long Island in the Vitiaz Strait, one piece of obsidian from Biliau was also assigned to Talasea using PIGME (Bird et al. 1981: 70). Four artefacts from Saoko village and Poin Kiau, examined by pXRF, also exclusively derived from Talasea (Gaffney et al. in press a). This seems to have been supplemented by a poor-quality black volcanic stone, probably local to the island. These areas of the northeast coast were all connected by three major coastal trading groups: the Siassi, the Tami and the Bel (Bilbil) who operated the Madang exchange network. New Guinea, showing key locations and obsidian sources: 1, Pam; 2, Lou; 3, Talasea, Kutau/Bao; 4, Gulu; 5, Baki and Hamilton (both on Garua Island); 6, Mopir; 7, Fergusson Island. Highly mobile coastal exchange around New Guinea often emerged as a form of logistical subsistence maintenance, as coastal and island groups with inadequate land for horticulture and agriculture would sail vast distances to exchange specialist products for bulk subsistence crops (Macintyre and Allen 1990). Around Madang and Astrolabe Bay, the dominant coastal trading group at ethnographic contact were the Bilbil people, who predominantly lived on Bilbil and Yabob Islands, just south of modern Madang. The Bilbil speakers were part of a larger community of Bel language groups that also included the Gedaged-speakers at Kranket, Siar, Bilia, Riwo, Sek, and Malmal around Madang Lagoon, the Takia on Karkar Island, and various others dotted along the Rai Coast (Z'Graggen 1975). Current culture history interpretations assume that the Bel groups are recent migrants to the northeast coast from the Bismarck Sea or Vitiaz Strait, perhaps arriving around 650 years ago and settling fringe areas not suitable for agriculture, but focussing on commodity manufacture for subsistence trading (Gaffney et al. 2017). In ethnographic accounts (Finsch 1888; Gaffney 2018; Miklouho-Maclay 1975), the Bilbil produced impressive red-slipped pottery, which they then took on trading canoes built in collaboration between the Gedaged and the Bilbil. On a number of large-scale trading voyages throughout the year, known as the dadeng, the Bilbil redistributed their pots with trade friends towards Karkar Island in the north, and along the Rai Coast towards Sio. These pots were exchanged for foodstuffs such as taro and canarium, and specialty items such as wooden bowls, spears, grass-skirts, paint/ochre, pestles and mortars, and lithic material. The mobility of these groups was much more dynamic than simply ‘sedentary’ groups practicing logistical trading voyagers for subsistence. It involved regular trade voyages of differing ranges and intensity in different parts of the year (Table 2), interspersed with more flexible movements around the coast or inland. On top of this, individuals were moving between different communities on a regular basis, for exogamous marriage, visiting trade friends and kin in other villages, for ceremonies, and political gatherings. In the colonial and recent pre-colonial times, the Bilbil would invest in substantial trade voyages to the Rai Coast when the return rates from their small yam gardens on the mainland were at very low levels (marked as the time of hunger). Similar food scarcity in the local environment is one major impulse for terrestrial forager groups to shift residential camps. Moreover, the departure of a group of men to the Rai Coast, being fed by trade friends along the coast, reciprocally obliged to provide for the Bilbil, would reduce resource stress in the home village around Madang. Miklouho-Maclay (1975), who befriended the Bilbil in 1872, observed flaked stone being used for shaving and scarification, and modern Bel speakers continue to report these as the major functions of the material used by their ancestors during the contact and colonial periods. Despite this, we know almost nothing about lithic technology before European contact. In the Madang area, only two pieces of archaeological stone have been examined previously; obsidian deriving from 70 to 90 cm at Brian Egloff’s excavations on Yabob Island (JB2-1E) (Egloff 1975). One of these could be assigned to Kutau/Bao (Talasea), while the other could not be confidently assigned to source (Bird et al. 1981: 70). In 2014, the authors undertook systematic archaeological excavations around Madang in an attempt to understand the emergence of ethnographic exchange networks along the coast, including the nature of mobility and lithic supply lines linking this coastline to the wider region. A number of archaeological sites were identified within Madang Lagoon and on coral islands south of Madang town (Fig. 2). At Yabob Island and Tilu clan area of Malmal village, lithic material was identified on the surface, while more material was recovered from stratified excavations at Tilu and also Nunguri clan area on Bilbil Island. Excavation at Tilu and Nunguri was systematic, being dug in 1 × 1 m test pits, generally following 10 cm spits across two layers. At both sites, layer 1 was over 1 m deep and contained mixed soil, while layer 2 comprised the original beach sand. Sieves of 4 mm were employed to collect small lithic fragments. Excavation at Tilu revealed a cultural sequence stretching back to about 550–650 years ago and included red-slipped Madang-style pottery, ancestral to modern Bilbil pots, along with lithic material, shell artefacts, shell and bone food waste, and human remains (Gaffney et al. 2017; Gaffney and Summerhayes 2017). The Nunguri sequence was similar, although may represent two depositional phases starting 500–600 years ago, and again from 300 to present. The material includes abundant, locally made Madang-style ceramics, as well as lithic material, shell artefacts, shell and bone food waste, and human remains (ibid). Lithic and pottery surface collections made at various locations on Yabob Island remain without good spatial or temporal provenience. However, the presence of characteristic Madang-style pottery suggests that all are associated with recent Bel occupation within the last millennium before present. Bilbil and Yabob Islands were hubs of the Madang-style pottery production and distribution network at ethnographic contact, while Malmal was a pottery consumption site, although members of these clans would produce canoe hulls for the Bilbil (Mennis 1981). Formal and geochemical analysis of the archaeological Madang-style pottery demonstrates that it was probably made locally on Bilbil Island from at least 650 years ago and exported north to Malmal, and south to the Rai Coast (Gaffney 2016). These sites are then all excellently placed to examine the nature of lithic technology and supply at the heart of the Madang exchange network, along with the possible differences in technology and raw material accessibility between highly mobile pottery producers (Bilbil and Yabob) who sailed hundreds of kilometres to redistribute products, and less mobile groups (Malmal) who did not undertake such voyages. The different lithic tool making material available to these Bel groups was interlinked with the geological distribution of different rocks. In Near Oceania, obsidian raw material has a naturally restricted geological occurrence. 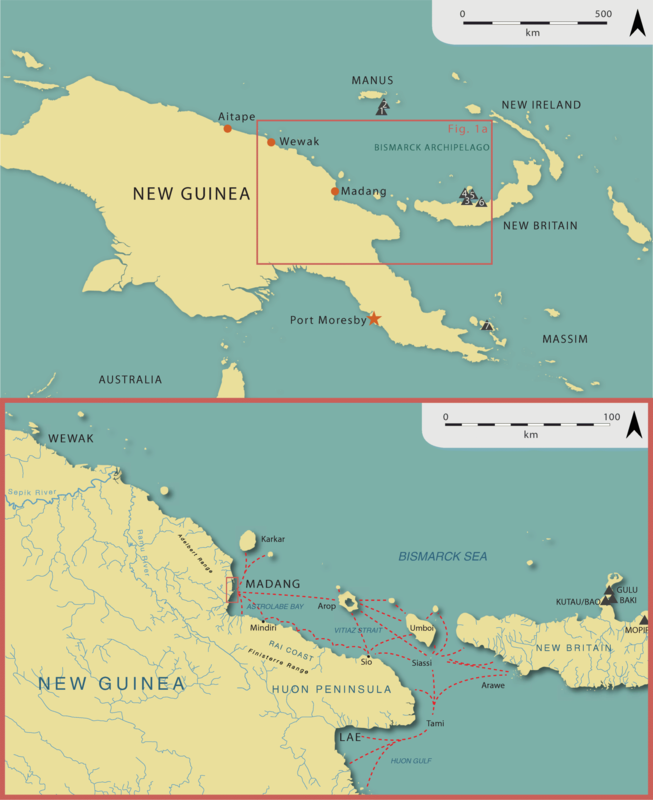 There are no obsidian sources located on the New Guinea mainland, and in the past, it was procured from four major resource zones: West New Britain, the Admiralty Islands, the D’Entrecasteaux Islands and the Banks Islands (Fig. 1). Because of its restricted distribution and distinct chemical signatures, obsidian found in New Guinea archaeological sites can be geochemically fingerprinted to their ultimate geological sources, which provides important information about procurement and exchange (Summerhayes 2009). The northeast coast of New Guinea itself is characterised by a diverse lithic landscape with variable availability of suitable raw material for tool production. This includes lowland alluvial plains and swamps around the Ramu and Markham drainage systems, and foothill/mountainous country around the Finisterre and Adelbert Ranges typified by volcanic, metamorphic and metasedimentary rocks (Dow 1977). Rivers passing through alluvial and coastal areas may also transport quality lithic materials downstream in secondary contexts. Around Madang, good-quality raw material is not abundant. The geology of coastal Madang is relatively young and most of its development took place during the mid–late Tertiary and in the Pleistocene (Reiner and Mabbutt 1976: 73). Structurally, the region is part of the Palaeogene Volcanic Arc (Bain 1973), which accounts for most of the physiographic features of the area (Loffler 1977: 7). Madang Lagoon lies on the Pleistocene–Holocene Wandokai Limestone (Fig. 2), a coral limestone plateau, which extends from the northernmost extent of the lagoon to the confluence of the Gogol and Nuru Rivers in the south (Robinson et al. 1976: 3). This formation comprises massive crudely bedded and cavernous biocalcirudite, calcarenite, calcilutite and mudstone, with subordinate arenite clasts, and conglomerates, most of which is unsuitable for lithic manufacture. More suitable stone resources are located inland from the lagoon, where several rivers drain through the Tertiary deposits of the Finisterre Volcanics, with basalt and andesite flow breccia, tuffaceous greywacke, tuff, agglomerate, argillite and minor limestones. The Meiro and Gum Rivers drain through the Gusap Argillite, with red and green cherty argillite, chert beds, greywacke, siltstone, subordinate basalt and andesite breccia, dolerite dykes, and cherty limestone. South of the lagoon is a recent Holocene alluvial deposit which extends from just north of the Gum River mouth to the Rai Coast in the southeast. These areas are formed by the flood deposits from major rivers draining the Adelbert and Finisterre Ranges and commonly comprise gravel, sand, silt and mud, along with good clay deposits for pottery production (see Gaffney 2018). The Gogol River and its tributaries drain inland deposits of the Kabenau Beds, which extends to the Sek River, containing well-bedded calcareous clasts, siltstone and mudstone, conglomerate, and minor limestone and lignite. To investigate lithic technology at Tilu, Nunguri and Yabob Island, the methodological design of the research followed two stages. The first involved an analysis of raw materials to describe the original source location of procurement, which can elucidate pre-colonial links in the exchange networks. The second involved lithic technological analysis to describe the nature of reduction and tool use on-site. Examination of the reductive flaked technology at the sites followed a hierarchical classification system based on the chaîne opératoire as described above, and as outlined elsewhere for New Guinea lithic analysis (Ford 2017; Gaffney in review; Gaffney et al. 2015), which sought to define distinct technological procedures operational within each raw material type. By examining each artefact’s chaîne opératoire—that is, how it has passed through different stages of procurement, production, use, re-use and discard—we can examine recurring patterns relating to how each material was being treated at the different sites. The attributes of flaking technology are informative about the stage of reduction, whether at the start of a fresh core, or towards the end of an exhausted one. They also indicate whether specific techniques were being employed to conserve the raw material, or if stone was being flaked in an expedient and ad hoc manner. In particular, the analysis sought to address: (a) if different raw materials were treated differently at each site, as it relates to the quality and abundance of the material, and the distance from site to source, and (b) if there was technological change over time in the stratified sequences at Nunguri and Tilu, indicating changes to technical actions informed by tool use or raw material accessibility. By addressing these central concerns, we can build interpretations about the value of the raw materials, the mobility of the tool-makers, and their place in regional exchange networks. To investigate the procurement and distribution stages of the chaîne opératoire, all lithic artefacts from the 2014 Madang investigations (n = 487, excluding three pigment fragments), including artefacts from Tilu, Nunguri and surface collections on Yabob Island were assigned to raw material class. These classes can be linked to known source locations or zones. The lithics were first examined in hand specimen and under low magnification to describe raw material. Basalt was distinguished from similarly coloured sedimentary rocks using a rare-earth magnet. Because most of the assemblage comprised flaked obsidian, a geochemical analysis was then used to distinguish the exact source of procurement, and the likely path along which the material moved during distribution. It is now well established that geochemical techniques, such as portable X-ray fluorescence (pXRF), can distinguish between all major obsidian flows in the Western Pacific and Island Southeast Asia region (Reepmeyer et al. 2011; Sheppard et al. 2010). The pXRF, in particular, has been favoured as it enables rapid and cost-efficient processing of bulk obsidian assemblages. This has the benefit of identifying rare but important sources present in assemblages, which can drastically alter archaeological interpretations about lithic distribution. As such, the total obsidian assemblage (n = 402) was analysed using a Bruker Tracer III-SD at the Otago Archaeology Laboratories (Table S1). To identify the obsidian source for each sample, the machine was optimised to target mid-Z elements (Mn, Fe, Zn, Th, Rb, Sr, Y, Zr, Nb) with green filter settings (40 kV per channel, filament ADC = 30 μA, filter = 12 mil Al + 1 mil Ti + 6 mil Cu, runtime = 180 s). The raw data was calibrated to parts per million (PPM) using the machine-specific quantification protocols (S1CalProcess) for the Bruker Tracer III-SD #T3S2521, based on 40 known obsidian standards. A basalt standard (BHVO-2) was run at the beginning and end of each session as a quality control to assess accuracy of the reported data (following Lawrence et al. 2014). Table 3 shows the accuracy of the Otago pXRF in reproducing US Geological Survey (USGS) recommended results for the BHVO-2 standard, and indicates that it is particularly poor at producing accurate results for Zn. Despite this, the precision of the machine (i.e. its ability to consistently produce the same results irrespective of its accuracy) is relatively good for all elements apart from Th, due to it being present in low concentrations. For these reasons, Zn and Th were excluded from results reporting and statistical analyses. 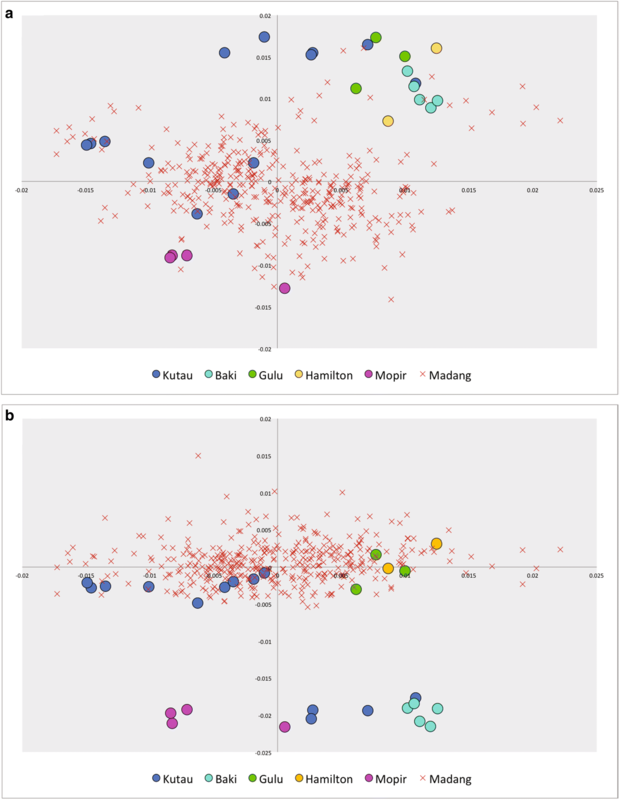 The artefactual dataset was then compared to known reference samples from major obsidian flows in the Bismarck Archipelago and Massim area: Lou Island, Pam Lin, Kutau/Bao (Talasea), Hamilton, Gulu, Baki, Mopir, East Fergusson Island and West Fergusson Island. Each of these samples was analysed in the same pXRF analysis under the same operating conditions. A principal component analysis (PCA) was then conducted on the PPM data using the MV-ARCH statistical program (Wright 1996). PCA is a multivariate statistical tool which groups samples by chemical similarities and reduces the original chemical variables down into uncorrelated principal components (PCs). These PC can then be plotted and chemical groupings can be assessed visually. To examine the reduction and discard stages of the chaîne opératoire, the analysis first divided each artefact into class: flake, core, or angular fragment (following Hiscock 2007), and formal tool fragments. Here, flakes have a platform, lateral margins and a termination when complete. At the time of discard, they are a detached piece and have not been used as a producer (see Witter 1995). Cores are producers of detached pieces. They do not usually have a ventral surface. If they do have a ventral surface (a flake core), then there is evidence for the artefact being used as a producer core after that ventral surface was produced. Cores have at least one negative flake scar and usually at least one platform. Angular fragments are debitage that do not have any landmarks to distinguish it as a flake or core. Formal tool fragment is a heuristic category that includes objects deliberately produced with recurring forms such as polished axes, adzes, grindstones and so on. An attribute analysis was then used to describe individual technical elements on each artefact, directly relating to reduction and discard activities such as platform treatment, size of resultant flakes and flaking control (following Inizan et al. 1992 and Holdaway and Stern 2004). Quantitative measurements were calculated using plastic digital callipers and goniometer. To examine the use and rejuvenation stages of the chaîne, micro-fracture due to usewear and macroscopic retouch was assigned conservatively on each artefact to demonstrate to what extent each piece was used as a tool. Due to the small size of most lithic artefacts in the assemblage, an optical microscope (× 20–40 magnification) was used to examine each sample. Here, ‘tools’ are a separate category indicating use. Whereas cores/flakes are broadly mutually exclusive groups, tools can be made on cores, flakes, angular fragments, or from abraded pieces, and so on. The Madang lithic assemblages consist of almost exclusively knapped stone, including small flakes and angular fragments, along with a limited number of cores. The desired product of this knapping was small flakes for cutting and scraping. Along with flaked material, the formal tools include a polished bark cloth beater fragment from the surface of Nunguri, Test Pit 1, and grinders and files from Spits 2 and 6. At Yabob, a polished axe fragment of indeterminate shape, and a piece of writing slate were recovered from the surface. The writing slate has parallel lines inscribed on one side and cross-hatched lines on the reverse. Such tablets were common in colonial schoolrooms around the Pacific (Flexner 2016: 106). 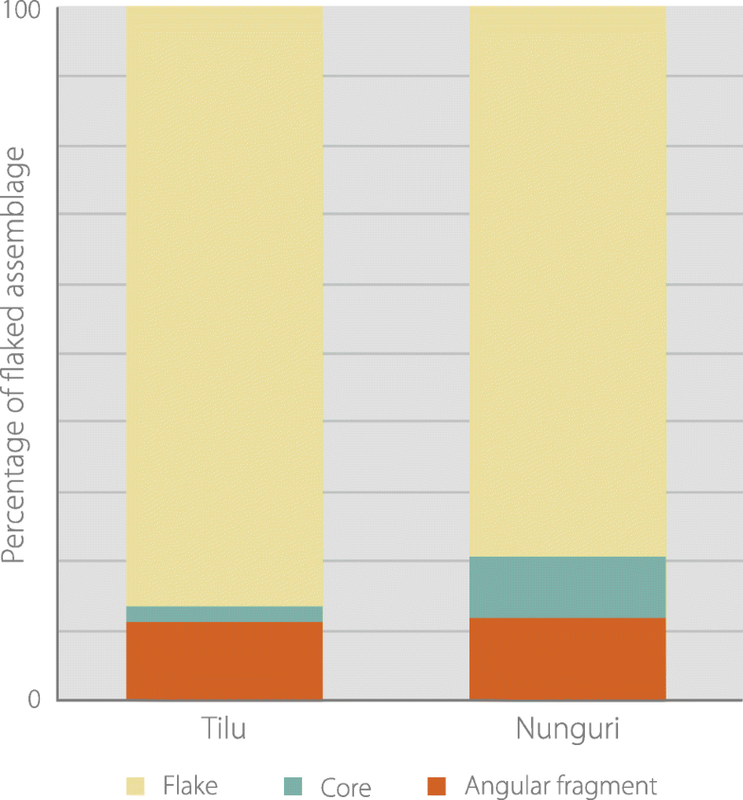 Table 4 shows the Tilu, Nunguri and Yabob Island assemblages divided by artefact class. The ratio of these artefact classes relative to each other gives a good indication about the nature of flaking and discard on site. In both the Tilu and Nunguri assemblages, flakes are dominant indicating an expedient and simple flaking technology but a relatively conservative use of raw materials as people tried to derive as many flakes from cores as possible. There are no clear chronostratigraphic trends relating to the proportion of flakes, cores and angular fragments, demonstrating that this manner of simple flaking occurred throughout the occupation sequences. The ratio of flakes, angular fragments and cores at Tilu and Nunguri are broadly identical; however, there are fewer cores (n = 2) represented at Tilu (Fig. 3). The single most important raw material by weight and count at all sites is imported obsidian (Table 5). This is predominantly black in transmitted light with some grey and silvery varieties and can include rare anomalies such as globules, flow banding and microfractures inherent in the rock. Cortex is only present on one obsidian artefact (N-5146), which is smooth but non-water rolled. Tilu contains very limited non-obsidian material, which consists of one chalcedony core in Spit 2, three unretouched basalt flakes/angular fragments from Spits 8–9, and one angular fragment of pyritic or metal-rich stone from Spit 3. The function of the pyritic stone is unclear, but fire-making is one possibility (e.g. Stapert and Johansen 1999). At Nunguri, a much wider variety of raw materials were flaked, used and discarded on site. Non-obsidian raw materials include argillite, basalt, chalcedony, chert, orthoquartzite, quartz and a low-grade sedimentary rock (possibly greywacke). Although the geochemical signatures of these were not examined due to a limited sample size, the colour of the raw materials suggests multiple procurement locations. Argillite, distinguished by a muscovite presence and detrital grain, occurs in black, grey-dark grey and red. Chert, being opaque and highly siliceous, occurs in black, brown, green, grey, pink, purple, red, red with grey banding, red with orange banding and red with white banding. It is possible that many of these colours occurred within the same source zone or even within the same nodule due to the heterogeneous nature of chert. Chalcedony, formed mostly of chalcedonic quartz and extracrystaline water, is semi-translucent and occurs in black, white, grey and red. Orthoquartzite is granular under magnification and brown or grey-light grey in colour. Quartz is both milky quartz and translucent varieties. Water-rolled cortex on the argillite, chert, chalcedony, orthoquartzite and a low-grade sedimentary stone indicates that these were procured as pebbles from riverine environments. Many of these sedimentary stones would be available from the Gusup Argillite formation in the Adelbert Ranges, west of Madang. Surface survey by the authors around the inland region of Madang shows that red chert and argillite nodules are also present in rivers and creeks around the Wandokai Limestone, having been transported downstream (Gaffney et al. 2018). Another likely source is along the Rai Coast, where Bel traders had access to material coming down to the coast from the Finnisterre Ranges. At Yabob Island, a similar range of raw materials is present, including obsidian, along with chert (grey, brown, red with white banding, red with black banding), argillite and basalt. Because the Yabob Island material is from surface survey and poorly provenienced, it is here used to describe the availability of raw material on the island, but will not feature in the statistical analysis of reduction and use in the following sections. Formal tool fragments demonstrate some of the intended products within each raw material type. At Nunguri, the polished bark-cloth beater fragment is made from fine-grained limestone, but the absence of limestone flaked material throughout the deposit indicates that this item was not produced or recycled on-site. The sandstone grinders/files again show no evidence for production or recycling. At Yabob Island, a single polished black basalt axe fragment suggests that much of the basalt flaking material from Yabob and Nunguri may be from axe reworking. The lack of basalt rough-outs, pre-forms or substantial flaking debris indicates initial manufacture did not occur on the islands. Polished basalt axes, polished limestone bark-cloth beaters and sandstone grinding material were all imported as ready-made exchange items. At Nunguri and Tilu, there are no clear trends over time, indicating that obsidian was used more or less frequently relative to non-obsidian raw materials. No particular non-obsidian material is present more commonly through the spits, suggesting that at all times a large imported obsidian component was supplemented with minor non-obsidian raw materials. The pXRF geochemical results (Table S2) show that every single obsidian artefact derives from the West New Britain source zone, on the Willaumez Peninsula. The PCA in Fig. 4, plotting the first two principal components, shows all of the Madang obsidian samples clustering away from the West Fergusson Island reference samples from the Massim, and the Lou and Pam Island samples from the Admiralties. 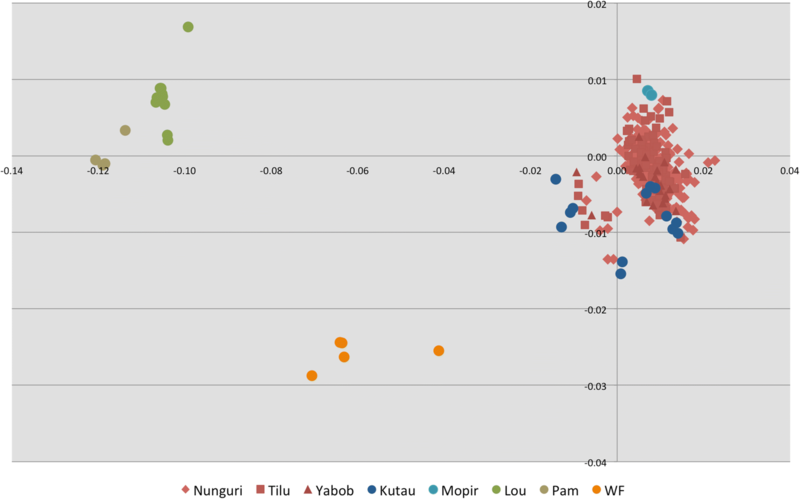 To distinguish between individual sources on West New Britain itself, we carefully compared the Madang PCA data to the Kutau/Bao, Baki, Gulu, Hamilton and Mopir reference sources in three dimensions. As seen in Fig. 5, all of the obsidian derives from the Kutau/Bao source near Talasea on the mainland Willaumez Peninsula. When PC1 and PC2 are plotted, which account for 90% data variability, most of the Madang and Kutau/Bao material separates out from the Gulu, Baki and Hamilton reference material. When PC1 and PC3 are plotted, it clearly shows the Madang and Kutau/Bao separation from Baki and Mopir, where Mn and Sr load heavily on the third component. Although in the first two dimensions some Madang artefacts appear to cluster with the Gulu source material, the Gulu material does not match on the PPM Sr or Mn values. Although there is some chemical overlap with Hamilton reference material, this source was never used in the past because it solidified underwater making it brecciated and distinguishable in hand specimen. The archaeological obsidian clusters into two ellipses mirroring the Kutau/Bao reference samples. However, obsidian from each site can be assigned to both ellipses, suggesting that both flows were being exploited and exchanged to the east without differentiation. Technological analysis shows that (1) raw stone was more intensively conserved at Tilu than at Nunguri and (2) obsidian, in particular, was conservatively flaked at both sites compared to other raw materials. Simple flake tools and associated debitage, including un-utilised flakes, angular fragments and exhausted cores, characterise the assemblages. This indicates on-site manufacture, use and discard. At Nunguri, 74% of flakes fractured conchoidally, and at Tilu 84%, demonstrating a continued tradition of hard hammer percussion. However, no hammer stones were recovered. This may be a sample size issue or suggest that suitable material for percussion was rare. Most flakes are regular or irregular in shape. Irregular flakes have an asymmetrical profile and represent less standardised or controlled flaking but are not necessarily unintended, as the resultant edges are just as sharp. Elongate and expanding flakes are uncommon and although some elongate flakes were made, blades were not systematically produced. Most of the flakes are very small (Table S3), being ~ 160 mm (mean maximum dimension) at Nunguri and ~ 140 mm at Tilu, suggesting that the original blanks being obtained as cores were not large. By raw material, the obsidian flakes from both sites are substantially smaller than the non-obsidian component (Table S4). When comparing the two obsidian assemblages, in general, Nunguri’s flakes are slightly larger than those at Tilu (Table 6). The Wilcoxon-Mann-Whitney U test results reported in Tables S5–S6 show that obsidian flake weight, width, thickness and possibly maximum dimension are significantly different between the two sites. This test is a non-parametric ranked comparison of means in two independent samples (Tilu and Nunguri) with two-tailed significance levels reported. The core and angular fragment measures were not compared due to small sample sizes at Tilu. Furthermore, the reduction charts in Figs. S1–S2 more clearly show that at Nunguri, non-obsidian flakes tend to be larger than obsidian. The figures plot thickness against the square root of percussion length × maximum width of flakes at both Tilu and Nunguri. Following Witter (1990: 101), this eliminates exponential effects in plotting the size of artefacts. All obsidian flakes fall under Witter’s 5 g weight threshold, identified as being impractical for further reduction and can be described as ‘fine-duty’ artefacts. A number of non-obsidian artefacts exceed this threshold and were discarded prior to exhaustion. When Nunguri and Tilu obsidian flake measures are plotted against each other (Fig. S3), it shows that Tilu lacks the larger obsidian artefacts present at Nunguri. Flake platform attributes can also distinguish the stage and intensity of reduction. Platform modification that may represent deliberate overhang removal was significantly more common at Tilu (58%) than at Nunguri (39%) (Pearson chi-square test results (all flakes): χ2 = 7.45, df = 1, p = 0.006; Pearson chi-square test results (obsidian flakes only): χ2 = 275.115, df = 4, p ≤ 0.001). At Tilu, this was predominantly scalar (67%) with some stacked-step-fracture (33%). At Nunguri, the pattern was the same (scalar = 75%, stacked-step-fracture = 25%). Three obsidian flakes at Tilu and three from Nunguri also appear to be overhang removal flakes. If this was deliberate platform preparation and rejuvenation, it reflects more conservative flaking technology at Tilu. At Nunguri, the frequency of platform modification gradually increased through the spits indicating more intensive reduction over time, while at Tilu, the pattern is unclear, perhaps due to a smaller sample size (Fig. 6). By raw material at Nunguri, obsidian platforms were more commonly modified, followed by chalcedony, orthoquartzite, chert and quartz, while basalt, argillite and low-grade sedimentary did not display platform modification (Fig. S4). At Tilu, the two basalt flakes did not display platform modification and are most likely the result of maintenance activities. This indicates that higher quality material, particularly obsidian, was being more conservatively reduced. The platform angle of a flake tends to increase through reduction until discard and is a good indicator of the reduction stage and size of the core being reduced (Marwick 2008). The interior platform angle of flakes at Nunguri was on average 100°; this differed substantially across the raw material classes but not through the spits. Argillite and basalt seem to be in early stages of reduction, with angles below 90°, while chalcedony, chert, orthoquartzite, quartz and particularly obsidian asre in later stages of reduction with obtuse angles (Table 7). Interestingly, the single low-grade sedimentary piece has a large platform angle despite being cortical, which may reflect the morphology of the original cobble. At both Tilu and Nunguri, basalt flake platforms are wider relative to thickness, and chert and obsidian platform sizes (thickness × width) are broadly similar, although there are more very small obsidian platforms. Platform type at Nunguri also distinguishes lower quality flaking material as being less intensively reduced. The argillite and low-grade sedimentary platforms were all cortical, indicating that they were struck from a fresh cobble that was probably relatively accessible (Table 8). About half of the basalt flakes had cortical platforms, while less than 20% of the chert and chalcedony flakes were cortical. No obsidian platforms were cortical, confirming that this material entered the site as cores in later stages of reduction. A substantial percentage of obsidian (23%) and chert (16%) flakes had crushed platforms, indicating a similar flaking technology applied to both raw materials, and demonstrating hard-hammer flaking from small nuclear pieces, or bipolar percussion. The range of obsidian platform types at Nunguri and Tilu are broadly similar and show later stages of reduction. The number of scars on the dorsal surface of a flake is usually interlinked with the size of the flake and the stage and intensity of flaking. At both sites, basalt flakes display a small number of dorsal scars, while obsidian flakes carry, on average, three scars, despite being small. Table 9 suggests that, in general, chert flakes at Nunguri display more scars than obsidian. To test this, a Kruskal-Wallis test, which is a non-parametric version of the ANOVA, examining the means of ordinal values (dorsal scars) of different categorical groups (raw materials), using Monte Carlo extraction method due to low counts of rare raw materials was applied. This shows that the scarring on chert flakes is not significantly different to that on obsidian given the small sample of chert flakes (χ2 = 0.148, df = 1, p = 0.7). Cortex presence indicates if an artefact was produced from a fresh blank/core in the early stages of reduction, or at the end of a core’s use life. Only one artefact at Tilu was cortical: a non-intensively reduced chalcedony unidirectional core, broken from a small nodule in the hand or on an anvil. At Nunguri, a single large red argillite core was covered in 50–75% cortex, and a chert, argillite and low-grade sedimentary angular fragments were covered in < 50% cortex. No Tilu flakes were cortical; however, at Nunguri, a substantial percentage (42%) of non-obsidian flakes and one obsidian flake were cortical (Table 10). Cores are here classified based on the number and location of platforms following Holdaway and Stern (2004) (see Table 11). Those cores with multiple flaking directions from different platforms have been rotated to conserve raw material. More simple unidirectional cores with a single platform and striking direction tend to be more expedient. Bidirectional cores display two opposing striking platforms with flakes struck from opposite directions, while bifacial cores have a single platform with flakes detached from two core faces. Obsidian and chert cores at Nunguri tend to reflect increased rotation in order to maximise the available platforms on small cores, while the argillite and orthoquartzite reflect limited rotation. The single obsidian core at Tilu is multidirectional, indicating a technique of rotation, and it may have later been split using bipolar percussion, while the chalcedony core is unidirectional with a single platform. Most cores displayed a variety of scar shapes supporting that flaking was not standardised for a specific form. Lastly, at Tilu, one flake in particular appears to be bipolar shatter, displaying crushing at both the platform and distal ends and two percussive bulbs, suggesting an added stage of bipolar splitting of cores into flakes to maximise raw material. The single obsidian core at Tilu is 11.93 mm (maximum dimension) and 0.61 g, and also appears to have been reduced to exhaustion and broken on an anvil using bipolar splitting, while the chalcedony core is slightly larger (22.21 mm, 4.93 g) and non-intensively reduced from a small nodule by free-hand. This may account for the lack of cores at Tilu compared to Nunguri. At Nunguri, one large red argillite core (155.55 g) in Spit 14 was non-intensively reduced and discarded probably due to the poor quality of the material. Chert and obsidian seem to have been reduced similarly; however, it is not clear if the added stage of bipolar splitting was applied to obsidian at Nunguri. 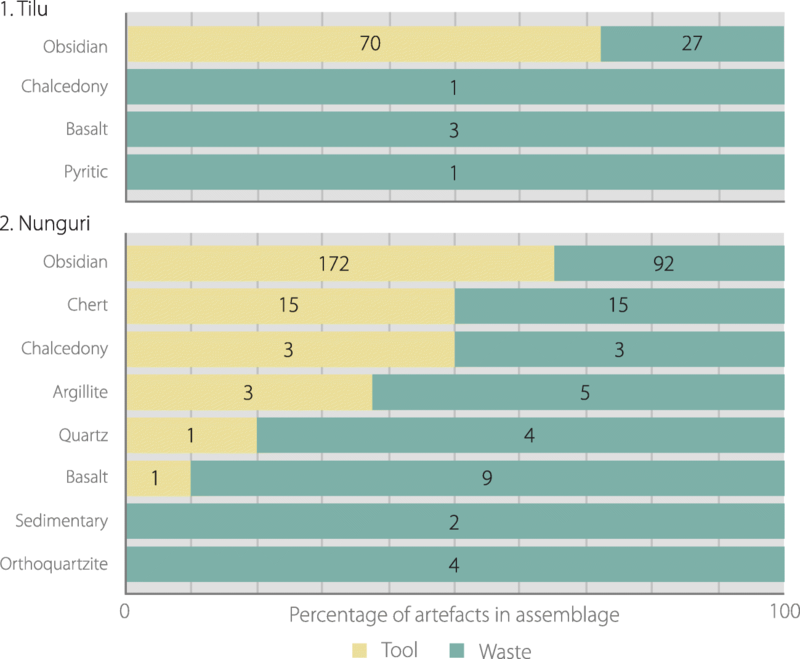 The usewear present on different artefact classes describe which pieces of the flaking process were commonly selected for use and which were discarded without being utilised. Flakes seem to have been the desired usable product of this flaking: 67% of flakes being used, compared to only 9% of cores and 24% of angular fragments. Obsidian was more intensively utilised at both Nunguri and Tilu compared to other raw materials. At Nunguri only 30% of non-obsidian artefacts display usewear, compared to 60% of obsidian pieces. Basalt, orthoquartzite, and low-grade sedimentary stone did not display any usewear and argillite, chert, chalcedony and quartz pieces displayed occasional usewear (< 50%). However, chert flakes (as opposed to angular fragments and cores) displayed usewear 65% of the time, similar to obsidian flakes. At Tilu, the basalt, chalcedony and pyritic rock did not display usewear; however, 73% of obsidian artefacts did. This attests to the intensive use of obsidian compared to other raw materials at both sites. Non-obsidian objects appear to have been mostly discarded without use, perhaps because they formed the debitage from different flaking activities with the desired product being a select few usable flakes. The percentage of artefact circumference that displays usewear is a good indication of use intensity. That is, if an object is discarded before it is used to its full potential, we might infer that the material was treated less conservatively than if it was used to exhaustion. Table 12 shows that most obsidian artefacts were utilised but displayed less than 50% circumference usewear. Deliberately produced flakes appear to have been preferentially selected for use compared to angular fragment shatter. Cores were only rarely utilised after their use as flake producers. The number of usewear locations also demonstrates the intensity of use, and perhaps also the number of times a piece was utilised for one or more tasks before discard. Table 12 shows that most obsidian pieces were used along only one edge; however, some pieces were used along two edges or more, perhaps being reused for multiple activities. Multiple wear locations could also indicate specific activities such as piercing, drilling or hafting. At Tilu, utilised obsidian pieces usually displayed one location of use (68%) but could also display two (27%) or three (5%) discrete usewear locations. At Nunguri, the trend was the same for obsidian piece (1 location = 59%; 2 locations = 32%; 3 locations 8%; 4 locations 1%). However, non-obsidian utilised pieces almost always displayed only one location of use (85%). Retouch along edges to resharpen and extend the use-life of an artefact is another good indicator of which materials were being conserved. Only 15% of artefacts Tilu and 16% at Nunguri were retouched suggesting limited reuse. 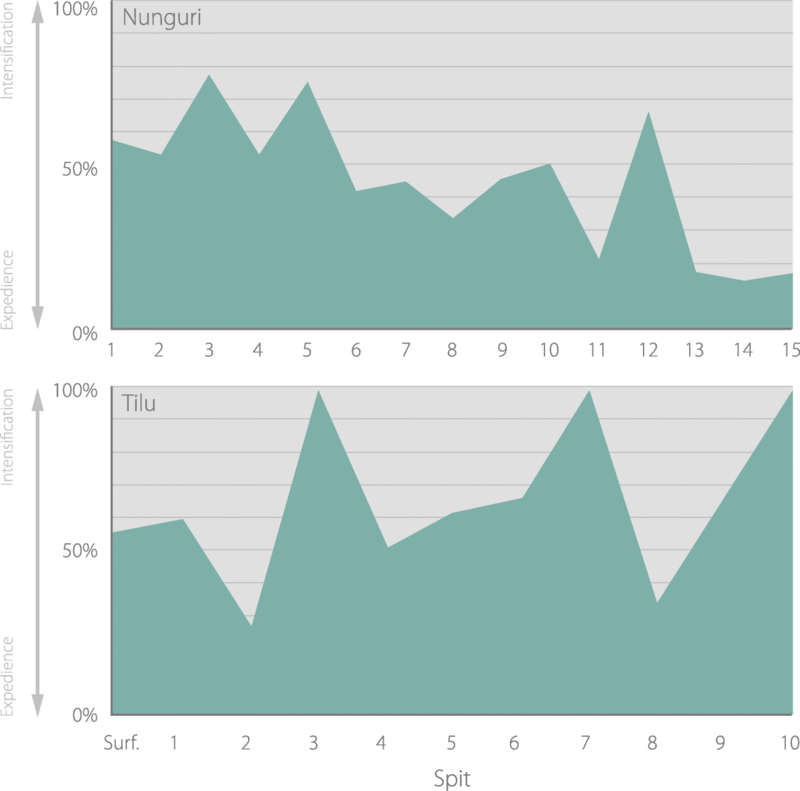 Angular fragments were more commonly retouched (Tilu = 22%; Nunguri = 36%) due to their larger size, compared to flakes (Tilu = 13%; Nunguri = 15%) and cores (Tilu = 0%; Nunguri = 6%). This is because many of the obsidian flakes and core were already too small for effective retouching. At Tilu, only obsidian was retouched. At Nunguri, obsidian (17%), chert (7%), chalcedony (33%), argillite (25%) and basalt (10%) objects were retouched, while orthoquartzite, quartz and low-grade sedimentary rock was not. Importantly, there is no statistically significant difference in the percentage of artefacts being retouched after use at Tilu and Nunguri (Pearson-chi square: χ2 = 0.615, df = 1, p = 0.433). The percentage of circumference retouched along with the number of discrete retouched locations on a tool indicates the intensity of re-use techniques. It can also give clues to the nature of use: what activities the tools were being used for. Table 13 shows that most obsidian pieces that were retouched were only retouched minimally along one edge, with less than 25% of the circumference being retouched. This is consistent with the usewear data presented above. The retouch type, position and shape are also good indicators of possible use functions. All retouch at Tilu was scalar. At Nunguri, 96% of retouch was scalar, with rare step termination retouch being applied to chert (2%), and invasive retouch applied to obsidian (2%). Almost all retouch position was direct, with percussion from the ventral side forming flake scars on the dorsal surface (Tilu, n = 5; Nunguri n = 24), and inverse, with percussion from the dorsal side forming flake scars on the ventral surface (Tilu, n = 2; Nunguri, n = 12). A small number of artefacts were retouched bifacially, with flaking on both the ventral and dorsal side of the same edge (Tilu, n = 1; Nunguri, n = 2), and in an ‘alternate’ fashion, with direct retouch in one area and indirect retouch in another (Tilu, n = 3; Nunguri, n = 4). Retouch shape was almost exclusively straight (Tilu, n = 11; Nunguri, n = 36) and concave (Tilu, n = 1; Nunguri, n = 14) indicating the tools were used for cutting and scraping. Working with organics such as bamboo, grasses and wood would be plausible candidates; however, more intensive usewear and residue studies would be required to confirm this. Rarely, retouch was convex or along a point (Tilu, n = 1; Nunguri, n = 2), perhaps for boring or drilling activities. A few instances of modification that do not appear to be usewear or retouching of utilised edges occur at both Tilu and Nunguri. This is described as ‘shaping’ and indicates small alterations designed to shape the flake or fragment prior to use. At Nunguri, a number of broken flakes were subsequently crushed along the break to allow for holding, and usewear occurs on adjacent edge. Two obsidian flakes and two obsidian angular fragments at Tilu and two flakes from Nunguri, one obsidian and one chert, also appear to have been shaped into points for piercing activities. The ratio of utilised or retouched material (tools) relative to unutilised material (waste) gives a good indication of the intensity of use and the conservation or expediency of the overall lithic technology on site. At Nunguri, 59% of artefacts were tools, while 41% did not display any signs of use and were classified as manufacturing waste. Conversely, at Tilu, 72% of artefacts were tools while only 28% were waste. These differences are statistically significant (Pearson-chi square: χ2 = 5.298, df = 1, p = 0.021) and show the Tilu artefacts, in particular obsidian, were being more intensively used. What is even more significant is the ratio of tools to waste based on raw material type (Pearson-chi square: χ2 = 41.879, df = 8, p ≤ 0.001). As shown in Fig. 7, obsidian is used as a tool substantially more at both Tilu and Nunguri compared to other materials, although this may reflect the low sample size of non-obsidians. Raw material is a guiding factor in any lithic technology, informing the maker what can and cannot be produced. From available materials the occupants of the Madang coast selected specific types for producing specific tools. As such the chaînes opératoires differ by raw material and are subtly different at each site. Although it is difficult to characterise some of the raw materials due to their rarity, this overall indicates distinct technical decisions underlying the flaking of lower quality and possibly more readily accessible stone, compared to high-quality exotic imports. These chaînes are schematised in Figs. 8 and 9. At Nunguri in Bilbil Island, there is more raw material variability and artefacts are larger, indicating greater access to those raw materials. Both obsidian and chert were favoured for simple utilised flake tools. The cores and angular fragments were occasionally picked up and used if the edge was good, but this was not the target product. Obsidian was more intensively reduced than chert, and more heavily used and reused, perhaps because both were used for fine-duty cutting and scraping, but obsidian was sharper and more effective. Although no basalt artefacts displayed a ground or polished surface, these are probably all the bi-product of reshaping axe-adzes, displaying no usewear or retouch, and being treated non-intensively. Chalcedony, argillite, quartz, orthoquartzite and a low-grade sedimentary stone were also flaked and sometimes used, but these materials do not show the intensity of reduction evidenced for obsidian. These materials may have been imported onto the island ad hoc as cobbles. Basalt, limestone and sandstone were probably specialist import items, traded in as formal tools or blocks of material (sandstone). At Tilu in Malmal village, conversely, there are limited raw materials, which are almost exclusively imported obsidian. These flakes are smaller than at Nunguri, in later stages of reduction, and with more instances of techniques being used to conserve the stone, such a platform modifications and possible bipolar splitting on cores to obtain usable flakes and angular fragments. Although obsidian reduction is more intensive at Tilu, and the lithics were more frequently selected for use, the nature of use was no more intensive. As Blades (2008) points out, reduction intensity during the production stage should not be conflated with use intensity because the underlying decision-making criteria are different. Reduction intensity usually relates to raw material conservation reflecting blank or core size and access to more of the same material, whereas use intensity (usewear and retouch) relates to functional requirements. Previous studies of New Guinea lithics have shown that macro- or microscopic usewear on expedient flakes, especially at low magnification, can only be used as a guide for which objects were utilised (e.g. Brass 1993). This is because flakes used for a short amount of time may not acquire diagnostic usewear. Residue analysis would be the next step to clarify how many flakes had been used in total. A fuller description of the range of possible activities completed with obsidian tools is presented in Kononenko (2011). Chalcedony and basalt were also imported in very low quantities and were possibly treated in a similar way to on Bilbil Island. Pyritic rock is also an import and may have been used to produce fires (but this remains speculative). At Yabob Island, the sampling technique was inconsistent with Nunguri and Tilu and so a chaîne opératoire is not described. However, the number of different raw materials was similar to Nunguri, suggesting that the procurement strategies were more closely aligned with the Bilbil Islanders than those at Tilu site to the north. Despite variation between the sites, technological comparisons show sparse evidence for change over time at Nunguri and Tilu, indicating technical actions informed by tool use or raw material accessibility were relatively constant during the several hundred years of site occupation. Having described the chaînes opératoires we now want to situate these in the lithic landscape/taskscape and build interpretations about the mobility of the tool-makers, and their place in regional exchange networks. What are the implications for regional and local mobilities given similar, albeit slightly different chaînes opératoires at the different sites? Because the chaînes are almost identical it demonstrates closely related sequences of reduction, and perhaps shared learning traditions, including intra-community mobility. This would involve the movement of people between Bilbil, Yabob and Malmal, creating shared ways of doing things within this small area of the northeast New Guinea coast. This may have taken the form of women moving from natal groups to marital groups (assuming a similar kinship structure to today, see Gaffney 2016: 341), young boys spending time with adoptive families (see Gaffney 2016: 58 citing Welsch et al. 1992), and everyday movements to different settlements within extended kin communities around the coast. However, the additional stage of increased platform preparation and bipolar splitting at Malmal (Tilu) probably indicates technological responses to limited resource access, with existing technical knowledge being drawn upon to conserve raw materials when required. For groups with less frequent/less far ranging mobility or indirect resource access, we expect fewer cores relative to flakes in the overall assemblage (Bamforth and Becker 2000; Ditchfield 2016; Holdaway et al. 2004) and innovations like bipolar flaking (Hiscock 1996) (see Table 1). Bipolar splitting and intensive reduction beyond core exhaustion could account for this lack of cores for Tilu at Malmal and reflect poor access to raw materials. Possible bipolar splitting has been put forward in a number of Pacific sites throughout the Late Holocene (e.g. Sheppard 1993). This leads us to hypothesise that the Bilbil Islanders had more frequent access to obsidian along with a variety of sedimentary stones such as chert, obtaining it from local middlemen on the Madang coast, the Rai Coast or even the Vitiaz Strait during long range and regular logistical trading voyages by canoe. Those at Malmal were probably less frequently or less distantly mobile around the northeast coast and were reliant on the Bilbil Islanders (and probably the Yabob Islanders) to redistribute stone resources around Madang (Fig. 10). We now elaborate on this hypothesis and its implications. In any given trade voyage, it is likely that seafarers would undertake a variety of forms of procurement. Just as lithic raw material procurement can be embedded in subsistence scheduling amongst hunter-gatherer groups (Binford 1979; Blades 2002: 12), so too can trading groups incorporate lithic procurement with subsistence trading. In the case of the Bilbil and Yabob Island traders, it is likely that the exchange of obsidian and possibly materials such as chert and basalt axes took place alongside bulk trades of taro and other crops for ceramics. Similar scheduling overlaps also occurred amongst the Bilbil and Yabob potters who would travel to the coast to collect clays but also to trade with mainland groups for food and collect bush material for canoe making and house maintenance (Mennis 2006, 2011). Ethnographically the Bel dadeng (trade voyages) revolved around obtaining subsistence foods. However, these bulk trades could be enhanced with small and rare valuables known as samum (Mager 1952: 128). These included beads, grass skirts (Mennis 2006), and in the archaeological past could feasibly have included obsidian, axes and perhaps cherts. The primary reason that obsidian was acquired preferentially to cherts relates to function (obsidian being the sharpest known natural material), with minor concerns perhaps related to the lustrous nature of the material and sacred/social value placed on obsidian (see Hayden 1998; Taçon 1991; note, currently amongst the Bel, stories about obsidian are kept amongst initiated male elders). It is likely that the Bel trading groups acquired their obsidian from middlemen on the Rai Coast or in the Vitiaz Strait. Ethnographic evidence suggests the Siassi traders moved the stone across the Strait onto the Rai Coast (Harding 1967), while oral traditions indicate the Bilbil may have obtained the stone from Siassi or other people on Arop/Long Island and Umboi Island (Mager 1952: 123, see also Gaffney et al. in press a). This is consistent with previous archaeological analyses from the Strait that demonstrate obsidian derives exclusively from the Talasea sources (Gaffney et al. in press a). Although it is possible that the Siassi or a similar group sailed directly to Madang to trade their obsidian (see Mennis 1980, 1981), it is more likely that the Bilbil sailed to the east to acquire it, given the presence of Madang ceramics in Rai Coast sites (Egloff and Specht 1982; Lilley 1986), the Vitiaz Strait (Egloff and Specht 1982; Lilley 1986), and in the Bismarck Archipelago (Gosden and Webb 1994; Summerhayes 2001), and the relative absence of Sio pottery in and around Madang (Gaffney 2016). All of the obsidian imported to Madang by the Bilbil Islanders ultimately derived from Kutau/Bao in West New Britain. This is significant, showing that within the last c. 600 years, this source had come to dominate lithic supply along the northeast coast. This obsidian has been found extensively around the Pacific and Southeast Asia since the late Pleistocene (Summerhayes 2009). However, Golitko et al. (2010) note that on the Sepik coast after about 2000 years ago, lithic assemblages contained substantially more obsidian from the Admiralties sources, which become dominant compared to the West New Britain sources. This may be a result of specialist traders on Manus, antecedents of the Manus Tru observed at ethnographic contact (Mead 1937). Similar changes emerged in the Bismarcks as Admiralties obsidian came to dominate recent assemblages in northern New Ireland, formerly typified by West New Britain material (Summerhayes 2004). The direct distance from site to source is of little relevance here, as the New Britain sources were in fact much more accessible through down the line exchange across the Vitiaz Strait and along the northeast coast, than the Admiralty Islands, which required an extensive open water crossing. Perhaps this Late Holocene fissioning of supply lines—one linking the northeast coast to West New Britain and another linking the Sepik coast to the Admiralties Islands (Fig. 10)—is related with technological innovations in watercraft, making direct sea crossings less risky, or reflects broader demographic increases creating shorter range but multiplicitous exchange networks through time (Lilley 2017). Because there is no Fergusson obsidian present around Madang, it may indicate that to get obsidian to the Sepik, these supply lines bypassed the Madang network and moved into the Bismarcks, the Admiralties and then to the Sepik. However, because West Fergusson has been in use since around 2950 years ago (Mialanes et al. 2016), this absence may also reflect sampling issues in important chronological periods in the northeast coast. Superficial similarities in pottery forms may indicate a link between the Admiralties and the Madang potters (compare spouted vessels from Manus and Bilbil in May and Tuckson 2000); however, more in-depth technological investigations of pottery manufacture indicate that the Vanimo (Sepik) and Bilbil (Madang) potting traditions have a common origin (Pétrequin and Pétrequin 2006), probably deriving from the Vitiaz Strait area or somewhere in the Bismarck Volcanic Arc (Gaffney 2016; Lilley 1988), although some argue from eastern Indonesia (Pétrequin and Pétrequin 1999; Terrell and Welsch 1997). The obsidian sourcing evidence does not support strong connections between the Madang networks and those around the west Sepik. 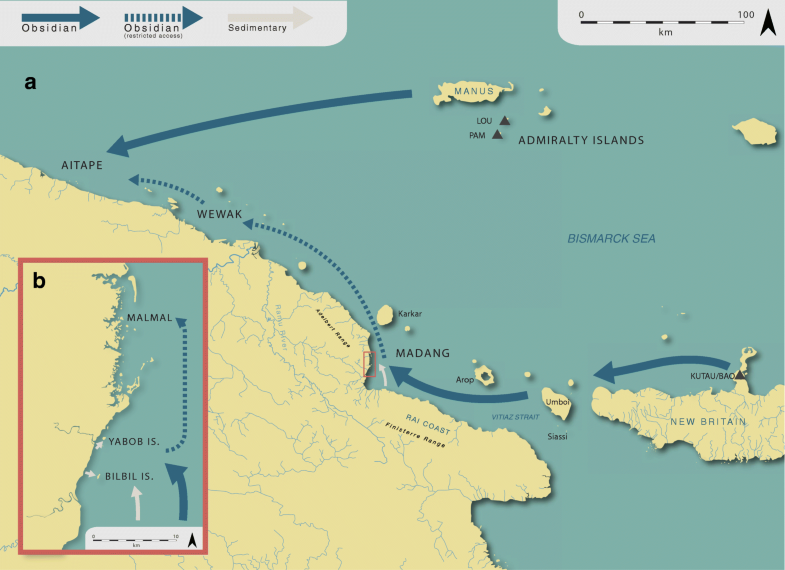 It does however indicate that within the Madang network, the major supply lines led back to the east and the West New Britain area. This supports oral history evidence (Mennis 2006), and linguistic evidence (Ross 1988), which indicates the northeast coast Austronesian speaking groups (including the Bel) dispersed from the West New Britain region. As the Bel themselves say, their gaze was cast to the east. Oral traditions from the Willaumez Peninsula also suggest westward movements of Gamai groups into Kove and even reaching the northeast coast of New Guinea (Specht 1981). Current culture history interpretations assume that the Bel groups are recent migrants to the coast, perhaps arriving around 650 years ago and settling fringe areas not suitable for agriculture, but focussing on commodity manufacture and trade (Gaffney et al. 2017). To examine this we could ask: did the Bel move from a ‘coloniser’ mode of lithic production to a ‘trader’ mode? This change has been posited for the southeast of New Guinea, where emergent trade networks focussed on redistributing ceramics, lithic material, and other objects around the coast (Summerhayes and Allen 2007). Irwin (1991) identified two different modes of exchange: the ‘coloniser mode’ which involved gift exchange between new communities and parent communities to maintain social links, followed by a later ‘trader mode’ which turned the same materials into commodities through established trade networks. Specht (2002) notes that this colonisation period in other regions of the Pacific was associated with pulses of large obsidian blocks being imported to new sites and expediently reduced, while later periods saw less material being imported and more conservative reduction. Walter et al. (2010, 2017) identify a similar proxy in the Austronesian-speaking colonisation of New Zealand. The implications of the present lithic analysis and the lack of dramatic change through time are (1) that we are not seeing the first colonisation mode because the sites excavated do not represent the earliest pulse of Bel colonisation from the east, or (2) there was no major change because the area was already populated on the mainland and the Bel were already geared towards subsistence trading, with established trading links all along the northeast coast. The exact source zones of the non-obsidian lithics are unknown, due to a lack of comparative reference collections in hand specimen and thin section. Future work would involve geological mapping of the inland regions of Madang and along the Rai coast to establish a petrographic and geochemical baseline for available resources. When more extensive regional information for lithic exchange becomes available this data can be tied in to network approaches (e.g. Golitko and Feinman 2015 for Central America, Hofman et al. 2014 for the Caribbean). However, the nearest possibilities are the Gusap Argillites and Finisterre Volcanics of the Adelbert Ranges about 10 km west of Madang, or the Rai Coast 30 km to the south. Many of the elders at Bilbil today state that sedimentary lithic material was imported from the Rai Coast (Gaffney 2016: 67) and procurement may have been factored in to regular trading voyages by canoe. As above, this would involve the exchange of raw material nodules with coastal middlemen groups, which traded with the Bel extensively in pre-colonial times, or chance collection of nodules while using mainland areas as part of customary land usage deals. If Bilbil Island traders travelled to the Rai Coast, stopping over with established trade friends or extended kin, then they may have had collecting rights in certain areas. Acquiring small nodules and cobbles of chert and chalcedony would have then been relatively easy. This might also apply to arrangements with mainland ‘bush’ groups around Madang. 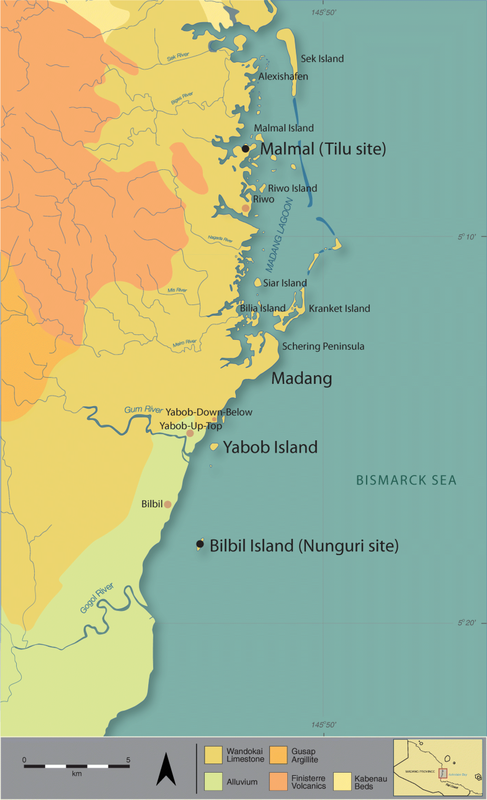 The Bilbil, for instance, held the right to patches on the mainland for collecting potting clay, and also ventured into neighbouring lands occupied by trade friends to obtain bush material for canoe making (Mennis 2011, 2014). We also know that Bilbil and Yabob potters obtained pottery anvils when visiting the Rai Coast and that these stones held symbolic power because they derived from ancestral places (Tuckson 1966). Raw material procurement may have been scheduled into these more structured activities as well. If this scenario were similar in the recent archaeological past, then the evidence from Nunguri and Tilu would suggest that those at Malmal had limited access to trade partners and fewer land-use rights along the coast than those on Bilbil Island, probably due to restricted coastal mobility. Oral traditions suggest stone axes, known as adiu or maka liwan were often obtained on Karkar or the Rai Coast (Mennis 1981: 58). Axes collected around Astrolabe Bay by early German recorders have been described as diorite-porphyry (Kunst & Buchdruckerei 1886: 9), which is dissimilar to the axe material represented in the Madang assemblages. There are no accounts of the Bilbil or Malmal producing their own stone axes due to a dearth of local raw material. There were, however, shell adzes excavated in association with stone tools at both sites, along with evidence for shell working (Gaffney et al. 2017). This raw material may have been used to supplement a small number of stone axes traded in from afar. This specific case study shows the clear and tangible benefits of the producer-trader mode of exchange that Sahlins (1972) has described for the Siassi along with the Tami and Bilbil groups in the colonial period. It demonstrates how more frequent long-range mobility by canoe could be beneficial for acquiring material wealth and manipulating regional and local power relationships. As we see at Bilbil, who specialised in pottery production and regular long-distance trade voyaging, this resulted in improved access to a variety of lithic raw materials, which they then probably redistributed to allies around Madang Lagoon. It is unclear if they then manipulated the exchange rate, and played on other groups’ ignorance of initial values as the Siassi did (Sahlins 1972: 265; see also Görlich 1998). Our archaeological observations are echoed in early ethnographic observations and oral histories, which state the Bilbil people were the most materially wealthy along the whole coast, and deliberately controlled the flow of goods to their advantage, using it to manipulate local power dynamics between themselves and mainland groups, who never retaliated against the Bilbil for fear of losing access to exotic or finely made commodities (Mennis 2006). This paper has demonstrated the nature of lithic supply lines along the northeast coast of New Guinea for the first time, and has shown that, in the last 650 years ago through to the present, there was a steady supply of Kutau/Bao obsidian being imported from the Willaumez Peninsula in West New Britain, supplemented by siliceous sedimentary lithic sources from the closer by Adelbert ranges or Rai Coast. Lithic technological analysis showed that at Nunguri the Bilbil Islanders, with more frequent long-distance coastal mobility (1) were reducing a wider range of lithic materials, and (2) reduced material less intensively than groups with indirect access. Conversely at Tilu, the Malmal with restricted coastal mobility levels in Madang Lagoon (1) were flaking a restricted range of lithic materials, and (2) reduced material more intensively. Long-range regular logistical mobility by canoe can be seen here as a way of expanding the lithic landscape, opening out different procurement opportunities for those groups willing to sail the extra mile. In this way, the relational mobility between the Bilbil Island and Malmal people (the Bilbil much more frequently undertaking extensive trade voyages to the Rai Coast and Karkar Island) is essential to understanding the dynamics between the two groups and something of their place in the wider exchange networks. This mobility also may have allowed the more mobile seafarers to play with exchange rates and elevate their own power along the coast. For the Mediterranean, Knappett and Kiriatzi (2016: 14) suggest that the topography of the region, with larger landmasses looking towards smaller island worlds, throws mobility and hyperconnectivity into ‘sharp relief’. So too for the emergent connectivity, overlapping in different parts of the northeast New Guinea coast in the last millennium. The sealanes along which Bel traders sailed and redistributed lithic material formed the binding for distinct and geographically disparate social groups (see Cooney 2004). We thank the people of Madang, Bilbil, Malmal and Yabob for their support in the field, the field team (Herman Mandui, Mary Mennis, Teppsy Beni, Affrica Cook and Judith Field), along with Sir Peter Barter for his support of Madang culture and archaeology. The field project was funded by a University of Otago Research Grant to GRS. The fieldwork was completed in collaboration with the National Museum and Art Gallery of Papua New Guinea, with the support of the National Research Institute in Port Moresby and local government in Madang. We also thank two anonymous reviewers for their constructive comment and critique.